Here, at Cart2Cart, we sense our clients and your passion, your desire to grow and improve. And, of course, by all means possible we strive to make a contribution to your inevitable success. 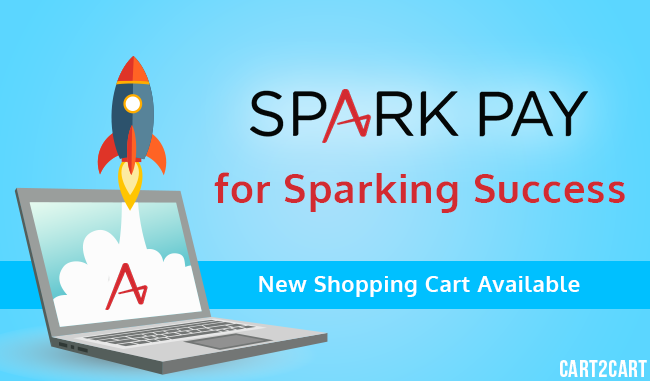 Hence, we’re happy to announce the extension of our migration opportunities by establishing a support of Spark Pay - a new e-Commerce solution that is now available for automated migration using Cart2Cart! Spark Pay, AmeriCommerce originally, is a functionally progressive hosted shopping cart owned by Capital One. Positioning itself as “easy enough for beginners, powerful enough for experts”, Spark Pay combines ease of management with the power of advanced marketing and SEO tools. Also, thanks to a range of free and premium responsible templates, you get the fullest control over your store’s appearance with no need to possess any coding skills. Perfectly suitable for omnichannel retail and running of multiple stores from a single admin, Spark Pay is designed to cover the largest customer audience possible. Moreover, you can easily sell products from literally anywhere by embedding your store offerings into a blog, Facebook page or even email. All these and many other features are now easily attainable with automated Spark Pay migration using Cart2Cart! Move products, orders, customers and a number of other entities from any of 60+ supported platforms effortlessly and securely. Start with a free Demo Migration and open new business prospects right away!